Hi everyone! This is my third week sharing coloring pages from the soon-to-be-released Tiny Buddha’s Gratitude Journal (available for pre-order now.) Previously, I shared the nature coloring page and the vacation coloring page. This one’s a no-brainer for me. Though I could live without it (did it for over twenty-five years! ), I’m most grateful for my iPhone—which I use most frequently to manage Tiny Buddha’s social media pages and my inboxes on the go, read eBooks, track my steps, and listen to music and guided meditations. If you had told me in high school I’d one day own one device that would replace my computer, my alarm clock, my camera, my pedometer, and everything on my book shelf, I would have asked what you were on (and if you had any left). Though I was a late iPhone adopter, using a flip phone for an embarrassingly long amount of time, I’ve had one for quite a while now, yet it still blows my mind how much it simplifies my life. I’ve had to work at being mindful with technology, as it’s pretty tempting to mindlessly surf when I’m bored, agitated, or feeling anything I’d rather avoid. But even this is a gift, in a way, as every time I check my iPhone, I have a reminder to check in with myself. What’s your favorite gadget, and why? If you haven’t already, pre-order your copy of Tiny Buddha’s Gratitude Journal here, and you’ll instantly receive three free bonus gifts. Lori Deschene is the founder of Tiny Buddha and Recreate Your Life Story, an online course that helps you let go of the past and live a life you love. To strengthen your relationships, get her new book, Tiny Buddha’s 365 Tiny Love Challenges. For inspiring posts and wisdom quotes, follow Tiny Buddha on Twitter, Facebook & Instagram.. 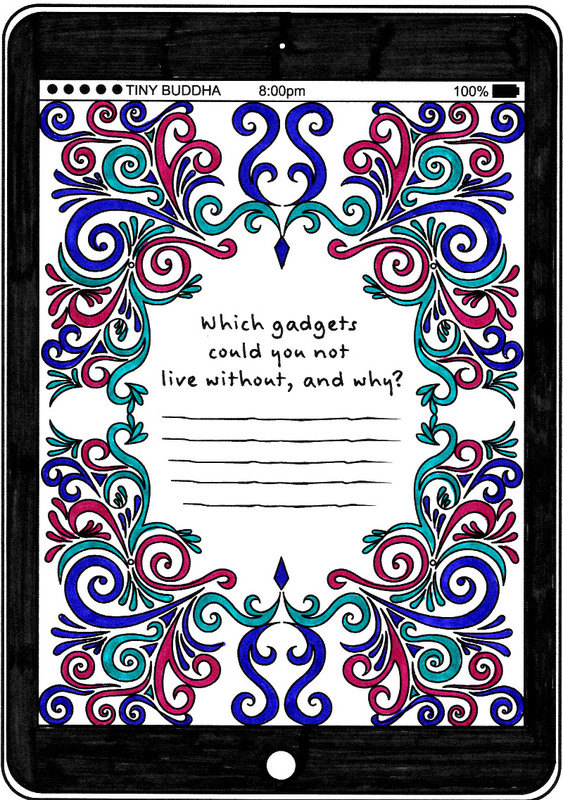 The post Technology Coloring Page from Tiny Buddha’s Gratitude Journal appeared first on Tiny Buddha.